Nah I don't usually sell. But mostly "poor" people like myself have to think this way. If I would have decent monthly incoming I would definitely not do this selling stuff. Nah I don’t usually sell. But mostly “poor” people like myself have to think this way. If I would have decent monthly incoming I would definitely not do this selling stuff. Selling is too stressful. I sell things that I don’t want anymore, but I rarely buy things for the purpose of selling. I can accept when something doesn’t work perfectly, but i wouldn’t sell something like that. It drives me nuts. I received my red light b158 yesterday. I am having a hard time removing the driver. How do you remove it? And also the mcpcb is difficult to remove because it’s glued to the pill. - Put driver in bench-vise. - Desolder +- wires from mcpcb. Same methode than Luminarium iaculator, except i didnt use heat, the nail i used had a blunt rounded point, i tilted it when inserting it in the wire hole so it would rest on the outer part of the driver/contact plate where it meets the wall of the pill to avoid damaging any component, a small deliberate blow on the nail head with a hammer was all it took to free the driver. XP-G2 S4 2B dedomed with arctic silver, BLF A6 A17DD-L from BG, 18AWG wires everywhere and I’m reading 4,5A in the tail. Since I didn’t have heat resistant paint I used black marker and sugru around the led. It should be heat resistant to 180°C (356°F). It’s not pitch black and not 100% matte finish, but I wanted to try it out anyway. Black permanent marker leaves way more reflective surface. The plastic ring is underneath, so it should be 100% reversible, if need be. Nice Your A readings encourages me that my uni-t clamp meter readings could be correct. Which battery did you used? Really interesting way of tail current readings with analogue meter. I knew I missed something.. But metal surfaces are never ever 100% flat, so pushing down a bit harder just improves to contact = a bit higher readings. Thanks, I already removed the driver but the aluminum mcpcb is very hard to remove because of the glue. I already damaged large part of the soft aluminum mcpcb and still it won’t come off. Mine took a bit of force. You need to find the right-sized thin flat-head screw driver. I worked on several points around the edges and pried. It took me a bit longer than in the video. Even if you damage the board, you can always get another copper board and reflow the LED onto it. Just be patient and work on it slowly. For stubborn MCPCB's, I've used a screwdriver or nail set and gave it a couple light taps from a hammer on the edge of the MCPCB, sideways force if you can - I think it worked every time for me, to loosen them up. Yeah the mcpcb was harder than the driver for me. The driver was easy because I didn’t care about saving it. I just torched it until whatever glue/solder that was holding it in went away and it came out pretty easy. The little brass ring stayed right where it was. Edit: Done 2 of them again with same results. MCPCB's almost unglued itself from pill with heat treatment (I just slightly twitched with needle nose pliers), emitters(red) stays on their place (not that I will ever use them but they survived). Nobody commented but Zipelgas method of current measurement looks very good and cheap :). If I only new that before I would not bought uni-t clamp meter cause his method look much simpler and better than clamp meter. Oh I like it! I wonder how many different lights that rig will work for. Also,as djozz uses this method - low value high watt resistor (0.01 ohms or so, 50W) in series with the cell, like a DMM, but you measure voltage across the resistor and calculate amps - supposedly more reliable than amp meters, clamp or DMM's. The resistor is anywhere from 5$ to $8 or so. Mouser has a good Vishay Dale one, 1% accuracy, for like $8. I got a 0.1R on order, and got a great quality 2 post connector all set to go in a small plastic enclosure (connector and enclosure provided to me). Thinking the connector will help with the setup. This is the one I'll get in my next Mouser order: mouser.com RH050R0100FE02, probably can be found else where, just couldn't find it at a good price. Edit: Done 2 of them again with same results. MCPCB’s almost unglued itself from pill with heat treatment (I just slightly twitched with needle nose pliers), emitters(red) stays on their place (not that I will ever use them but they survived). 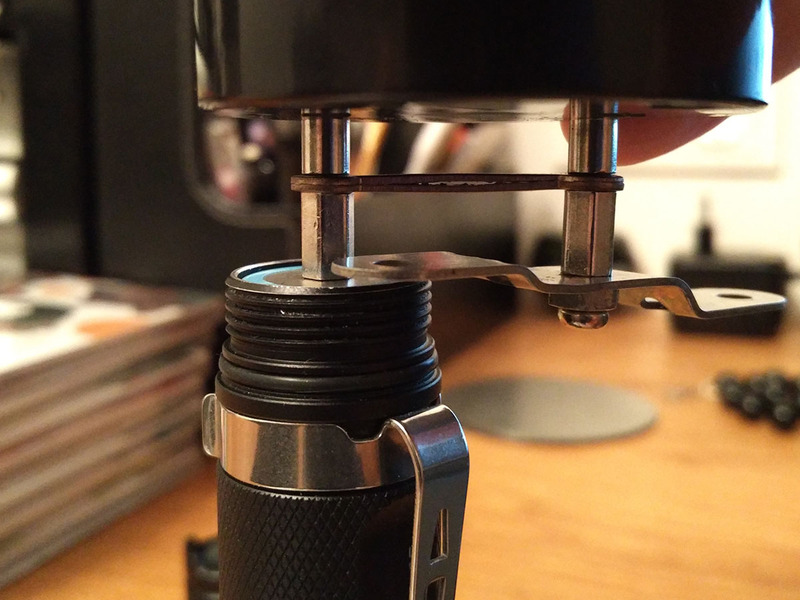 I’ve used it on almost every flashlight powerful enough, for me to care about amps and no problems so far. Additionally you can always attach heavy duty leads and use it in whatever situation. But I don’t want to highjack this mod thread, so I created another with a few more pictures. 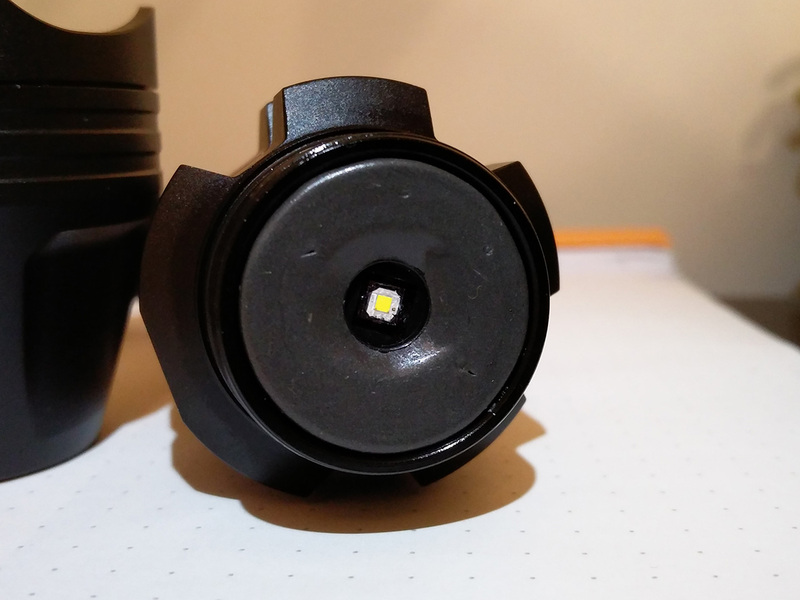 For painting the inside of the lens area around the LED, would something like Plasti Dip work? It is pretty matte and easy to use, doesn’t flake for those using dedomed emitters. If you mask off the LED and spray several layers, the mask pulls off with a clean line when you pull it off wet. Just asking and I will give it a shot when my B158 gets in. Goes well with an XP-G2 and 2.8A driver. Is anyone selling a complete modded pill? Does XP-G2 S4 2B LED, limits amps up 2A ? Using same setup with xml 2 led both drivers, i got 2,85 Amps max. on tail-cup, It is higher than on XP-G2 S4 2B. Do i got low amps XP-G2 S4 2B leds ? I want more Amps 4-5A would be great. The LD-2 has a low resistance fet and will limit current to whatever the sense resistor sets it to but does not take into account parasitic resistance in the host. Take the tail switch apart and clean it and put it back together. Make sure you have a good driver ground. Make sure the pill is screwed in tight and that the end of the tube it is screwed into is not anodized under the brass lip. Make sure the switch retainer is snug. Bypass the springs and use fat leads on your meter. I made messurings without host and used both drivers. I pressed driver against battery” + “. and touched leads directly to driver and battery’s “ – “. The LD2/A6 have spring bypss. I got no more than 2.10 Amps on xpg- 2 using A6 driver and , around 2.85 Amps on LD 2, ln host it’s 2.55 Amps. So without host am getting more Amps on LD2 but still below 3. Why is it so ? Why so low readings on A6. Don’t know what is going on. Out of interest, I had an old XR-E lying around from an SK68. A Q5 maybe – who really knows? I sat it on a smear of thermal grease, and hooked up this driver that I had in the parts bin. Furthermore, I ran an XP-E2 red on a Noctigon with the 2.1A driver and it was no brighter than the stock red pill, that I could tell by eye. Samsung 30Q , why so low Amps below 3, on both drivers with xpg 2? DMM leads - stock ones never work well, never. You will even get inconsistent results, so whatever you report won't matter til you can give us a real readings with heavy wire leads.